This morning, Tory Burch presented her fall 2019 collection with feminine and sporty references, as per usual. 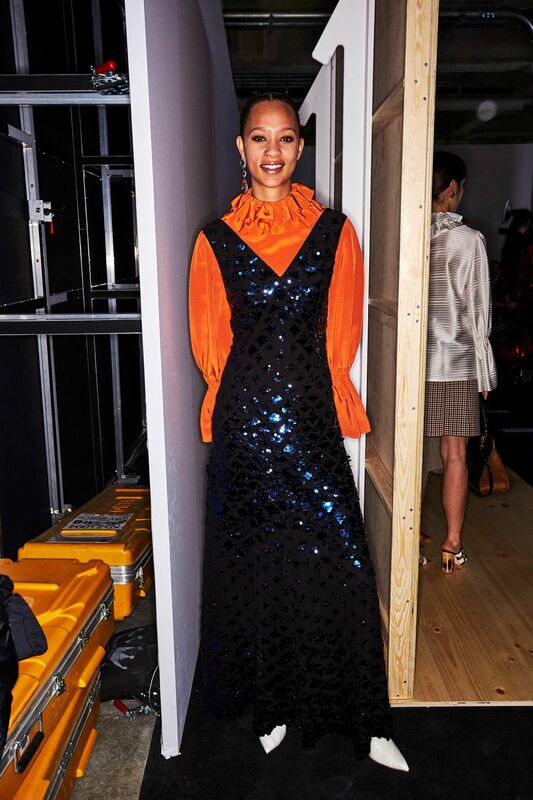 Before the show started, Mindy Kaling did a backstage takeover and walked fans of the brand though behind-the-scenes moments with models. Here's everything you need to know about the fall 2019 show. Lots of long floral print dresses and skirts took center stage and recalled styles of the early '70s. Perhaps it's an extension of prairie dressing, but Tory Burch's wood grain boots and one pair of really great flared jeans also fell into this category. Playing up to the sporty aspects of the brand, Burch incorporated lots of traditional collegiate colors. Burgundy, forest green, ochre and burnt orange came together in pieces like one duotone coat. Continuing the NYFW trend of Victorian ruffs, the label also mixed more than a few in, paired with blazers with collegiate style TB logos. This season, against all other trends, Tory Burch is camp bigger is better when it comes to the handbags. The majority of the bags in the collection were big enough to fit the average laptop and came in some of the aforementioned collegiate colors as well as leopard print. Ever single model wore earrings this season. Ranging in style from round crystals to long dusters that looked like they were made of glass beads, these earrings came in shades of clear, silver and the prettiest baby pink. To showcase the earrings, super hair stylist Guido Palau added long extensions to each model's head and styled them into a long ponytail. "At Tory's show, a normal length braid didn't feel enough, so adding the hair extensions and making it super long gives it a futuristic, avatar feel to it, but there is still a classic-ness to it," he explained.